Born in Pankalan Susu (Eastern Sumatra) and died in Amsterdam, Wispi worked as a journalist in Jakarta and Medan from 1952 to 1962. 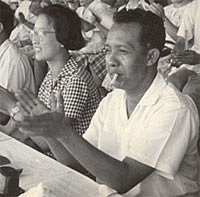 He was press officer of the Indonesian Navy from 1962 to 1965. He visited Vietnam in May 1965, where he met Ho Chi Minh. For political reasons he moved to China, where he lived from 1965 to 1970. Afterwards he studied and worked at the Deutsche Bücherei in Leipzig. Since August 1988 he has lived in Amsterdam. Agam Wispi was primarily known as a poet, but he also wrote a play and several short stories. He translated Faust into Indonesian. His poems are well known and much loved in Indonesia.